Coupons for Fathers Day are a unique and personalized gift for your special Dad that will definitely impress him for many days to come throughout the year while he enjoys using his coupons at his most convenient and needed times. There are 2 different kinds of coupons below with the one above all for a Car Wash and the other one below is for Yard Work, Movie Night, Car Wash, Breakfast in Bed, and Special Dinner and I also have some blank coupons to fill in with whatever you want to give and do for special Dad. Are there any chores that Dad continually is asking the kids to do? Here is a great idea - Create a coupon book that divvies up the chores, and have the kids promise to do the chores willingly when they are presented with a coupon. Make the coupons good for a whole year! Fathers Day is a celebration of honoring our fathers and celebrating fatherhood, paternal bonds, and the influence of fathers in the society. Many countries including the United States celebrate Fathers Day on the third Sunday of June, but it is also celebrated on other days. The modern version of celebrating Fathers Day originated in the United States of America, and then after that the tradition spread to other countries around the world. We give thanks to Ms Sonora Louise Smart Dodd, a loving daughter from Spokane, Washington, as it is because of her struggle that Fathers Day exists today. Inspired by Ms Anna Jarvis's struggle to promote Mothers Day, Ms Sonora Dodd began a rigorous campaign to celebrate Fathers Day in the United States. The Spokane Ministerial Association and the local YMCA supported Sonora's cause, and then the first Fathers Day was celebrated on June 19, 1910 in the America. 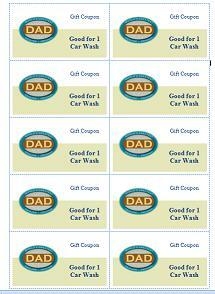 Return to Fathers Day Ideas from F.D. Coupons.